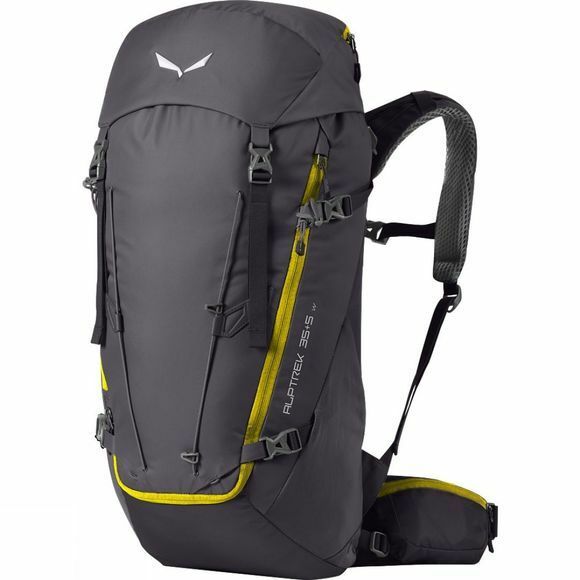 Designed for long–distance, multi–day alpine treks (for self–disciplined packers with a lightweight, minimalist approach), the Womens Alptrek 35L Rucksack is a comfortable trekking pack made of lightweight, very abrasion–resistant nylon with a fully–adjustable carrying system and a 35–litre capacity. Salewa's easy–adjust Custom–Fit Pro carrying system has an adjustable back length plus anatomically–shaped, padded shoulder straps and hipbelt for an individualised women’s specific fit. In addition, load lifter straps ensure optimal back fit over long distances, while the pre–shaped hipfin guarantees a snug fit and good load transfer to your hips. Large storage pockets provide plenty of room for spare clothing or your tent poles and there’s dual (front and top) access to the main compartment for fast and easy gear retrieval. And for rapid access to important items en route, the on–the–go pockets are easy to reach without having to remove the pack from your back. With a hydration system exit, ice–pick/ trekking pole attachment, rope fastener, load control and side compression straps plus the option to carry additional volume (5 litres) under the detachable, height–adjustable lid.